In Print (Delivery period: 12 days). J.K. Lasser's 1001 Deductions and Tax Breaks 2019 is the complete and thorough guide to reducing your tax burden. By listing every possible deduction and credit available to individual taxpayers, this book can help you achieve substantial savings on your 2018 tax return. Updated and expanded to cover new and changing tax law, this edition also includes an e-supplement covering the latest developments from Congress and the IRS to keep you fully up-to-date. Stop overpaying and gain peace of mind as you find the answers you need for your specific tax situation. Mine your paperwork for write-off opportunities, and claim your tax breaks correctly; easy-to-follow instructions give you clear guidance through the maze of worksheets to help you reclaim what is legally yours. Echoing cries of "Can I claim...? ", "How do I deduct...? ", "Where do I find...?" mean it's tax season again, and America's most trusted tax advisor is here to take away the stress. Find answers, save money, and streamline the filing process. Deductions and credits were put in place precisely to help everyday people like yourself keep more of their hard-earned money—but only if you claim them. 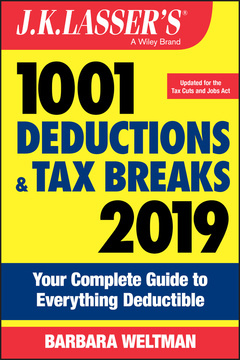 Instead of mounting an expedition into impenetrable tax code, let an expert do the legwork for you: J.K. Lasser's 1001 Deductions and Tax Breaks 2019 gives you the straightforward, no-nonsense information you need to stop overpaying and keep more of what's yours. BARBARA WELTMAN is an attorney and a nationally recognized expert in taxation for small businesses, as well as the author of many top-selling books on taxes and finance, including J.K. Lasser's Small Business Taxes. She is also the publisher of Idea of the Day®, a guest columnist for WSJ.com and U.S. News & World Report, is quoted regularly in major publications (including the New York Times, the Wall Street Journal, and Money magazine), is an award-winning blogger.